In recent years, Sarah Lawrence College has placed a greater emphasis on athletics by recruiting high school players for their sports teams. Opinions on this change vary from student to student. Some students enjoy the slight kindling of a fire that may one day create a sense of school spirit while others feel this is a backlash on Sarah Lawrence ideals and a misuse of money. I was able to interview a student who has a unique perspective on the topic. Quiana Jones (‘16) and right fielder on the softball team, did not come to Sarah Lawrence for sports. Instead she came for the science program with an interest in forensics. Her love for science evolved when she shadowed a pathologist and decided she wanted to pursue a career in medicine. Quiana became friends with players on the team during her sophomore year and increased her communal involvement by joining SLAC. She became curious and interested in softball, seeing it as a means of exercise and joined the team her first semester of junior year. Before she got involved in softball, Quiana saw a lot of similarities between recruits and science students. Recruiting has become big in multiple sports and there has unfortunately been a negative opinion on this presence. Quiana recalls the nervousness of many students, which was probably attributed to the rise of males on campus. Their presence on campus has improved and Quiana, understanding the feelings of both the student and the athlete, has suggestions on how they can become even more accepted here at SLC. There are many positives from athletic recruitment. First, it diversifies the population at SLC, which is a place that prides itself on being a unique safe space where anyone can belong. Athletics will improve and in the coming years teams will continue improving which will result in more money that could be pushed to other areas needing improvement at SLC. Hopefully, as continuing athletic talent enrolls at SLC, sports teams become more successful and inspire more school spirit. The one unfortunate thing about recruitment is where it leaves student athletes who were not recruited to SLC for sports. Quiana appreciates the commitment required in being an athlete that is often overlooked and seen as glamorous. Athletes make a strong effort on being a part of the SLC community. They frequent open mics, talks on identity, and school performances like midnight cabaret and the weekly improv night. Joining campus clubs can also help them form bonds with other students. Athletes, both recruits and non-recruits, are primarily students and should be seen in that respect. They have to do the same amount of work as everyone else while managing their time between practices and games. They deserve to be seen as true SLC students because that is exactly who they are. She may have only been on the swim team for a less than a year, but Hannah Lawson (’18) is already making splashes in and out of the pool. Swimming is a sport that seems to come naturally to the Portland, Oregon native. Lawson began swimming when she was quite young, her first experience was with a Summer Swim League at eight years old, and now she works as a swim instructor at SLC. Hannah is no ordinary swimmer; she’s also a record breaker. 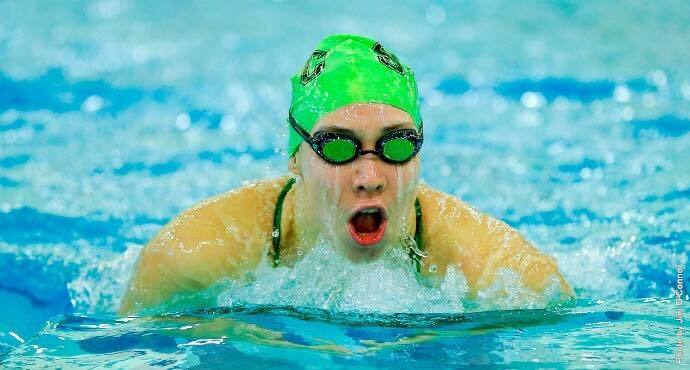 In her events, Freestyle and Breaststroke, Hannah has broken the 100 Breaststroke, 200 Breaststroke and is a member of the record-breaking relays in the 200 Medley, 400 Medley, 200 Freestyle and 400 Freestyle. One might think it might be hard to balance and excel at a collegiate sport while balancing classwork, but Hannah sees things differently. “No, it’s not very difficult at all [to balance everything],” she said. “It’s only 90 minutes a day and I think performing athletic activity is important for having a healthy lifestyle. Although the culture shock did not affect her as much when she went, she said she felt it more when she came back and it is something she is still processing. Still, Hannah looks back on the trip with fondness and speaks of how she and her host family still speak on a regular basis. “They’re like my second family,” she said. Whether speaking to her about India or swimming, her enthusiasm shows and her peers and mentors alike see it too during competition. “Hannah […] loves to compete,” said Head Swimming Coach Eric Mitchell. “She knows how to set goals and once she has her sights on it she works until she achieves it. It’s always nice to see qualities like that in young people. On January 30 and 31, the Sarah Lawrence Women’s Swim Team competed in the 2015 Skyline Women's Swimming Championship. “Women got Second [place] and it was our first time competing [at a Championship level]. We brought it in,” Lawson said of the event. This was not the only accomplishment Hannah has achieved while competing at the Skyline Conferences. She has been named Rookie-of-the-Week five times and earned all-conference honors at the Championship. The Upper New York State Collegiate Swimming Association Championship marked the final swim meet of the year, which stretched over the course of four days and lasted six hours per day. Any non-swimmer would be tired just thinking about competing for 24 hours, but Hannah was excited for the event. “She has been working hard and preparing for this meet,” Coach Mitchell said. “I am excited to see how fast she will swim in a few weeks. On the first day of the competition, Lawson competed with three other teammates, Gabby Risica (‘17), Colette Harley (‘17), and Jacqueline Quirk (‘17), to set a SLC 200 yard medley relay record. The foursome stopped the clock in 1:59.17 which challenged their previous record by a second. On the third day of Championships, Lawson broke the SLC 100 meter breastroke record when she clocked in at 1:08.82. But, Lawson wasn’t finished yet. The following day, she broke another SLC record with the 200 yard breaststroke. It is evident that Lawson is a serious and determined athlete that is committed and passionate about her sport. What started out as a fun activity for Hannah has become a regular part of her everyday life. Although the season is coming to a close, and the new one not set to begin until November, Hannah does not plan on taking a break anytime soon. Athletes are amazing people. I think they are amazing because they are able to balance a full course load and participate in competitive and physically challenging sports. The Gryphons 2014-15 athletic season has, thus far, been successful and full of growth. It is hard to believe that it is already time to wrap up basketball and swimming and move on to softball and men’s volleyball. But, without further ado, I present recaps and previews of more impressive student-athletes who are breaking school records and raking in points left and right! On Feb. 28, the Men’s Basketball team will finish their 2014-15 season. The young team won their first and only game against Pratt at Homecoming in November. The squad is noticeably young; it consists of nine first-year students. Head coach Chris Ehmer predicts that with more time the team will continue to grow and be competitive in every game. “I think we’ve come a long way, but we need to keep getting more polished,” Ehmer explained. Some highlights from this past season include a tight game against Maritime on Jan. 17, which ended in a very close loss of 62-65. In Skyline games against Martime and Mount Saint Vincent, rookie Keith Burns ('18) led the Gryphons with 29 points, which earned him Athlete of the Week. In three weeks, the swimmers of the Men’s and Women’s teams will ditch their bathing suits, goggles, and caps after three months of competing. The swim season will end with a four-day competition at the Upper New York State Collegiate Swimming Association Championships. Eric Mitchell, the coach of the Men’s and Women’s swim teams, remarked that this season was full of highlights including the recruitment of first-year student Hannah Lawson ('18) who set school records for the 100- and 200-meter breaststroke. Mitchell added that the swimmers have “become a strong and closer team, which are all good things. We work on camaraderie and make sure we are cheering for each other. Swimming is a team sport at the NCAA level, but it’s really an individual sports so it’s easy to just get in and swim your laps and not worry about what the person next to you is doing. We make sure that everyone is aware to cheer on the person who’s still swimming behind them.” Six seniors, three men and three women, will graduate from the team this year. 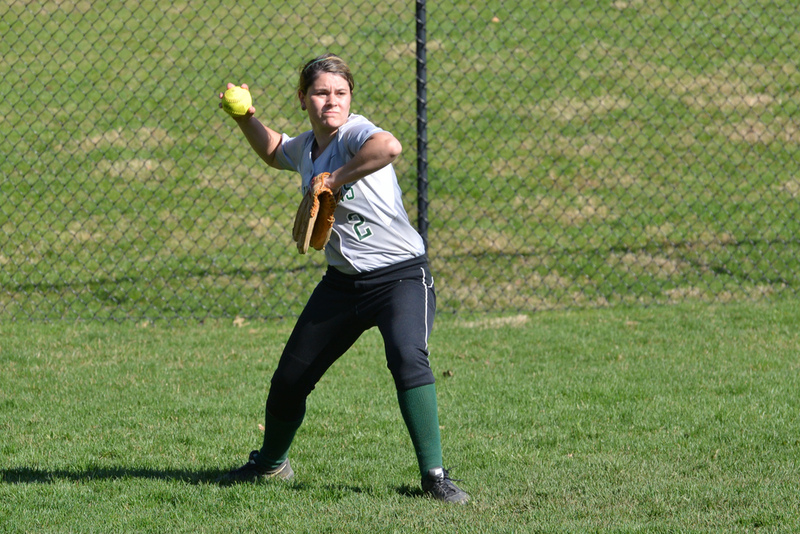 Although the softball season will not officially begin until March, second-year coach Chelsea Sheehan will train her young team for six weeks at Sarah Lawrence in preparation for their first game of the season. On March 11, they will kick off their season against Yeshiva, before traveling to Myrtle Beach for a week of training in warm South Carolina. Last year was Sheehan’s first season coaching at SLC and she notes that it was a “learning curve” for her and the team. The players and coaches have agreed that their season is not about winning or losing. Instead, the softball team looks to put in their full effort and energy during every practice and game. The team has seven first-year students and three seniors. The Gryphons will host their first home game of the season on Mar. 29 against Mount Saint Vincent. The annual Sarah Lawrence homecoming event will take place on Friday, Nov. 21 at the Campbell Sports Center from 7 - 10 p.m. There will be a variety of events including a men's and women's swim meet which will begin at 7 p.m., the men's basketball team's first home game of the season starting at 8 p.m., and a half-time performance by the SLC dance team. There will be a recognition ceremony for all senior student-athletes from the six fall teams: women's tennis, women's volleyball, women's and men's cross country and women's and men's soccer. Popcorn and cotton candy will be available for purchase as well as a tag sale featuring gently used Varsity sport equipment. All proceeds from the homecoming event will support the Students for Students Scholarship Fund (SSSF). Homecoming is organized by SLAC, SAAC and SSSF. SLC students, faculty members and staff are invited to gather as a community to cheer on Gryphon athletes as they compete and perform. The SLC men's basketball team comprised of 16 players who hail from many locations around the United States as well as three international students from Canada,Greece, Turkey, and Serbia. This squad is young, considering nine of the players are first year students, and only one senior remains on the team. Head coach Chris Ehmer notes that fresh faces are exciting to have on a team because it creates more options for the future, but at the same time, “it will take a few games for us to generate some positive chemistry.” This season will be the basketball team's first in the Skyline Conference, which will demand a higher level of competition. Ehmer expects this basketball season to be bright with an “exciting future.” The basketball team appreciates the support from the SLC community and intends to share their hard work and talent at homecoming. The men's and women's swim teams began practicing in late September and this homecoming will be the their fourth meet of the season. The women's swim team has five first-years students, in addition to the nine returning athletes. The men's swim team has two first-year students who will compete along with the seven returning athletes. This is the first year the men's team will compete in a conference.The women's team has already earned their first conference victory. On November 10, three swimmers, Hannah Lawson (‘18), Cameron Martinez (‘16), and Albert Riley (‘18) were honored by Skyline for their efforts in the last meet. The men's and women's swim team have a promising season ahead. This year, the team practices three times a week and they are excited to share their dance moves at homecoming. The National Collegiate Athletic Association (NCAA) has announced that beginning September 1st, 2014, Sarah Lawrence College will enter their final trial year of membership for the 2014-2015 collegiate year. Instead of entering the NCAA two years from now, the college is expected to become a full member by the 2015-2016 season. What is traditionally a four-year process will now become a three-year process. The process of joining the NCAA began four years ago after completing an “exploratory year,” as an effort by the college and Athletics Department to attract student-athletes who were interested in Sarah Lawrence. Since then, Sarah Lawrence has added several sports, such as women’s soccer, and has increased the lengths of seasons and number of competitions. In the 2013-2014 school year, over 150 student athletes competed in 15 varsity programs. In order to be granted this waiver, the college was required to produce compelling evidence of satisfactory progress. The athletics department was required to meet minimums on the number of student athletes who competed, as well as the number of competitions that were held each season. 12 varsity teams have recently transitioned from the Hudson Valley Intercollegiate Athletic Conference to the larger Skyline Conference for the 2014-2015 school year. “[The NCAA] was really impressed with our application for this waiver,” said Director of Athletics and Physical Education Kristin Maile. “They said it was one of the most thorough they had seen.” Maile is confident Sarah Lawrence will remain on track for full membership by 2015. By joining the NCAA, Sarah Lawrence would gain voting rights in NCAA legislature in addition to access to different grants, postgraduate scholarships funds, and guest speakers. Sarah Lawrence would also be eligible to compete in NCAA championships, allowing the Gryphons to compete past conference championships.